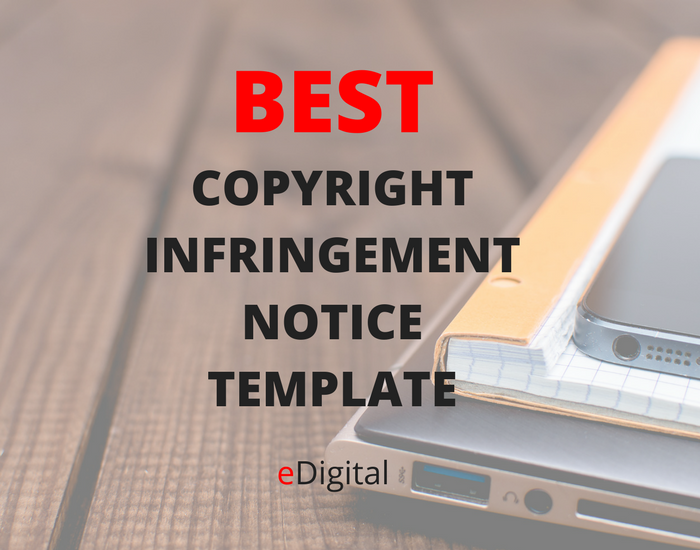 Find below the best image copyright infringement template. Written by MAU. Digital Marketing Specialist at eDigital. The Digital Millennium Copyright Act (DMCA) helps you file a copyright infringement from plagiarists and content scrapers. Everything you publish online that’s original to you is yours. It’s legally protected by copyright law, even if you don’t have “Copyright 2017” anywhere on your site. The Digital Millennium Copyright Act was passed in 1998 to protect online service providers from copyright infringement. As detailed by the U.S. Copyright Office, your content (including a blog post or a photographed image) is protected the moment it’s published, even if it’s on a personal blog. This means that if anyone takes your blog post, copies it, and shares it on their blog, they’re violating copyright protections and you can take action to have the content removed. If you want to sue for copyright infringement in federal court, you need to have the content registered with the U.S. Copyright Office. You don’t need to do this, however, to file a DMCA takedown request. I, (name), am the copyright owner of [type of content] [title of content]. The original content that has been infringed upon, [title of content] was published on [date] and on [exact link to site]. I have a good-faith belief that the use of this material in such a fashion is not authorized by the copyright holder, the copyright holder’s agent, or the law. Under penalty of perjury in a United States court of law, I state that the information contained in this notification is accurate, and that I am authorized to act on the behalf of the exclusive rights holder for the material in question. I request that you remove or disable access to the infringing material as quickly as possible. I may be contacted by the following methods: [phone number, address, and email].